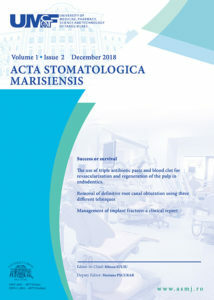 Acta Stomatologica Marisiensis Journal is an international journal dedicated to publishing high quality peer-reviewed articles pertaining to dental medicine. The themes covered by the journal include all the fields of dentistry, within a broad spectrum of disciplines and therapeutic areas, including, but not restricted to oral health, prosthetic dentistry, endodontics, paedodontics, orthodontics, oro-maxillo-facial surgery, implantology, dental materials, digital dentistry, nanotechnology and materials or medial engeneering. All manuscripts submitted to ASMJ must be original, high quality and conform to the “Uniform Requirements for Manuscript Submitted to Biomedical Journals” published in Annals of Internal Medicine (1997;126:36-47). All individuals listed as authors should qualify for authorship and should have participated sufficiently in the work to take public responsibility for appropriate portions of the content. Any other contributors, who do not qualify for authorship, should be acknowledged in an acknowledgment section. For further information about authorship, please refer to the ICMJE guidelines. Studies involving experimental research on animals or humans must conform to the guiding principles of the Declaration of Helsinki. In case of research involving human subjects, the manuscript must contain a statement within the “Material and Methods” section indicating that the study protocol has been approved by the author(s) institutional ethical committee and that all study participants have given informed consent to the participate, or that the ethical committee has waived the need for informed consent. In order to respect patient confidentiality and the right to privacy, identifying information such as patient’s names, images, hospital or hospital record details, should not be included in any published material unless the information is essential for the scientific content. If so, written permission must be obtained from the patient, and this permission should be submitted to the editorial office prior to publication. In case of manuscripts reporting clinical trials, these should be registered in a public trials registry at or before the time of first patient enrolment, as a condition for consideration for publication. Trials should preferably be registered in ClinicalTrials.gov, but in accordance with the guidelines of the International Committee of Medical Journal Editors any primary register of the WHO International Clinical Trails Registry Platform (ICTRP) is acceptable. The journal does not have article processing charges nor article submission charges. no portion of the manuscript is under consideration for publication in any other journal or has been previously published, except as an abstract of fewer than 400 words. all authors have read and approved the manuscript and accept responsibility for the full content. Authors must state all possible conflicts of interest relating to the manuscript (Declaration of interests form), or, if there are none, this should be stated as “none declared”. The cover letter should be signed by the corresponding author who should clearly mention in the letter`s text that he/she is empowered by all the authors to sign the cover letter and submit the manuscript on their behalf. The cover letter may include a list of potential reviewers or persons which the author(s) do not wish as reviewers. A brief statement of reasons of suitability/non-suitability should be given. The manuscripts, including all tables and references, must be prepared in Word format. The text should be typed double-spaced with no indent, using “Times New Roman” font size 12. Please also provide information on grants, contracts and any other form of financial support received in connection with the reported study. II. Abstract – an abstract of no more than 300 words should accompany manuscripts relating to original research, case presentations and review articles. This should be structured using the following headings: Introduction, Aim of the study, Material and Methods, Results, Conclusions. Detailed instructions on abstract preparation according to each manuscript type are given below. III. Key words – up to 10 keywords should be supplied by the author(s). the aims and objectives of the research being reported relating the research to dentistry, where not obvious. describe the procedures and analytical techniques. only cite references to published methods. include at least general composition details and batch numbers for all materials. identify names and sources of all commercial products e.g.Voltarol® Emulgel® Gel (Company, Town, Country). specify statistical significance test methods. refer to appropriate tables and figures. make no reference to previous literature. state implications of the results, relate to composition. relate to other relevant research. All references, tables and figures should be cited in numerical order. Language editing will be available during the editorial process, however authors whose native language is not English are strongly advised to seek appropriate grammatical assistance when preparing the manuscript. Poorly written manuscript will be returned for improvement before commencing the editorial process. V. Acknowledgments – please indicate any source of funding including grants, contracts or any other form of financial support relating to the study. VI. References – Number the references in the order in which they are first cited in the text. References should be indicated as full-size Arabic numerals in square brackets placed before punctuation marks. VII. Reference style – List all authors if six or less; otherwise list first three and add “et al”. Please abbreviate titles of periodicals according to Index Medicus, or spelled out in full if not listed in Index Medicus. Use the following formats, paying close attention to the use of punctuation i.e.colon (:), semi-colon (;), coma (,) and full-stops (.). For journal articles: Kim J, Fitzgerald JG, Sanders AK, Hofman HG. Long term survival following implantation of drug eluting stents. J Am Coll Cardiol. 2002;42:652-8. For a chapter in a book: La Rovere MT, Schwartz PJ: Baroreflex sensitivity. In Opie, L: Drugs for the Heart, Sixth Edition. Philadelphia: WB Saunders. 2006, pp.67-93. For a Book: Eisen HN. Immunology: an introduction to molecular and cellular principles of the immune response. 5thed. New York: Harper&Row; 1974. P.406. VIII. Acknowledgements – collate acknowledgements in a separate section at the end of the article before the references and do not, therefore, include them on the title page, as a footnote to the title or otherwise. List here those individuals who provided help during the research (e.g., providing language help, writing assistance or proof reading the article, etc.). IX. Units – follow internationally accepted rules and conventions: use the international system of units (SI). If other units are mentioned, please give their equivalent in SI. Figures should be prepared separately and sent as additional files, in TIF or JPG format, or compressed into one ZIP file. The figures should be prepared at the standard resolution of 300 dpi. All abbreviations used in a figure should be explained in the figure legend. Figure legends should be concise but explicit, enabling a clear understanding of the illustration. Figures and figure legends should be numbered in Arabic numerals in the order of appearance in the text and should not be imbedded within the text. Colour figures are preferred. Where a figure(s) is reproduced or adapted from another source, the author must first seek permission from both the author and publisher of the original material. Written evidence of permission for reproduction in both print and electronic formats for worldwide distribution must be forwarded with the manuscript and state “Reproduced with permission from…” or “Adapted with permission from…”. These must be self-explanatory and should not duplicate the text. Tables should be numbered in Arabic numerals in the order of mention in the text and should not be imbedded within the text. Instead, each table should be typed on a separate page at the end of the manuscript. All the abbreviations used in the table should be typed as footnotes immediately below the table. Tables should be created with Word’s Insert Table function in order to be editable. Do not submit tables as image files. The journal publishes comprehensive review papers on actual topics of interest related to dental medicine. Review articles should include a brief non-structured abstract of no more than 250 words and the text should be limited to 5.000 words including, tables and figures, excluding references. In extraordinary situations or relevant and extensive topics, the Editor-in-Chief may decide to accept papers with a higher number of words, a maximum of 400 words for the abstract and 6.500 for the text, including tables and figures, excluding the references. Review articles can be submitted by invitation or unsolicited. In both cases, full consideration will be given to articles providing a substantial contribution to a better understanding of a pathophysiological or clinical aspect in a field related to dental medicine. Case reports should be limited to presentation of a single particular and uncommon case, or uncommon presentation of a disease. Case series include description of a series of a maximum of 10 cases with common particularities. The abstract should be limited to 250 words, being divided into introduction, case presentation/presentation of case series and conclusions. The full manuscript should not exceed 2.500 words including references, figures and tables, being divided into sections headed Introduction, Case presentation/presentation of case series, Discussions, Conclusions. In manuscripts pertaining to case presentation or case series, the number of authors should be limited to four and the number of references to thirty and the number of figures to 8. Definitive reports on a full study, describing original preclinical or clinical study (which is not a case presentation or a case series report) research of high scientific level and timeliness. A concise abstract of no more 250 words is required. The abstract should state briefly the purpose of the research, the main results and major conclusions. An abstract is often presented separate from the article, so it must be able to stand-alone. The manuscript should be written clearly and concisely. The authors are responsible for providing the correct nomenclature, which must be consistent and unambiguous. The text should be arranged in the following order: Introduction, Materials and Methods, Results, Discussion and Conclusions. The length of the manuscript should be limited to 3.500 words (including references, tables and figures). A letter to the editor may refer to an article recently published by the journal, commenting on the article in a constructive professional manner the content of which, in the opinion of the author(s) would add the current status of knowledge in the field. If accepted, the letter will be send to the authors of the original article who will have the opportunity to respond and to have their response published in the same journal issue as the letter to the editor. The letters should be limited to 500 words, 5 references and 3 authors. No abstract is required. Editorials should be limited to 2000 words (including references) and should be related to an article published in the current number or to a specific topic that is current and of high interest to the readers. The journal publishes state-of-the-art articles that aim to provide an update on the current status of areas of high interest dental medical specialists. The principal/main aim of such articles is to offer the specialist and other practitioners a source of continuing education and forum for discussion. A state-of-the-art article should have a full text limited to 4.000 words, in addition to a 200 word unstructured abstract. Sections of the article should be divided using headings relevant to each particular case. Please describe the reason for complaining and specify the address for correspondence. Where the complaint is related to the editorial process, related to a manuscript, please include the name of the manuscript and the date the manuscript was submitted. The Editor in Chief, together with the editorial office will analyze the complaining and will answer to your complaint in maximum three working days.